Seeeduino Ethernet is a compact and multifunctional development platform, which merges data logging and processing, device control and Ethernet communication together into one. 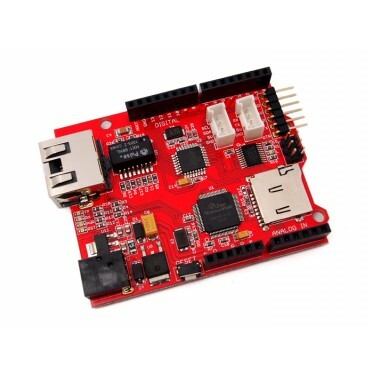 It's armed with a MEGA328P chip and a Wiz5100: the former provides an Arduino controlling style and the latter provides TCP and UDP Ethernet communication ability. Plus integrated SD card module, it's convenient and neat for remote data logging, processing or transferring via network.It has minimal height RJ45 port and power jack to suit most of existing Arduino Shields. Seeeduino Ethernet is a compact and multifunctional development platform, which merges data logging and processing, device control and Ethernet communication together into one. 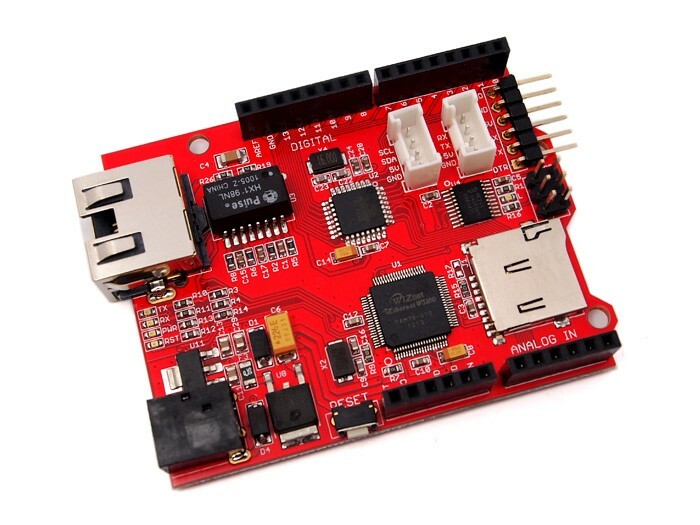 It's armed with a MEGA328P chip and a Wiz5100: the former provides an Arduino controlling style and the latter provides TCP and UDP Ethernet communication ability. Plus integrated SD card module, it's convenient and neat for remote data logging, processing or transferring via network.It has minimal height RJ45 port and power jack to suit most of existing Arduino Shields. Two Grove ports are included to enable easy extensions of sensors and actuators.